Have you ever wondered how rich Ndamukong Suh is? According to sources it has been estimated that Ndamukong Suh’s overall net worth is $40 million. Suh has accumulated his wealth thanks to his sports talent and by being one of the most rewarded players in football history. Since he is still an active sportsman, his net worth continues to grow. 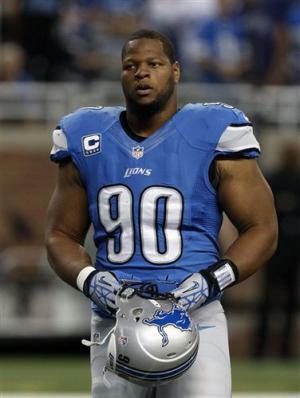 Suh was born into a family of four other children, who also grew up to become sports oriented. He attended Grant High School where he was a three sport star – in football, basketball and track. In his senior year in football, he collected 65 tackles including 10 sacks which earned him “Parade” magazine high school All-America honors, the 2004 Portland Interscholastic League Defensive Player of the Year and a Class 4A first-team all-state selection. Suh was also a finalist for the Portland Tribune’s Athlete of the Year. He was the sixth ranked defensive tackle in the US and took numerous official visits to different states before deciding to join the Nebraska Cornhuskers in January 2005, and soon after he enrolled at the University of Nebraska. During 2006 he played in all 14 games as a backup defensive lineman which earned him freshman All-Big 12 honors from “The Sporting News”. He then became the first Nebraska defensive lineman to lead them in tackles since 1973. In 2009 he was named the Associated Press college Football Player of the Year, and unanimously selected as a first-team All-American. In December the same year Suh was one of the five finalists for the Walter Camp Award and one of three finalists for the 2009 Outland Trophy, and was named the 2009 AP Player of Year. The following year Suh signed with The Agency Sports Management & Marketing and was selected second overall in the 2010 NFL Draft by the Detroit Lions, signing a $68 million contract, and playing with the team for the next five years. In March 2015, Suh signed a $114 million contract with the Miami Dolphins, making him the highest-paid defensive player in NFL history. Despite his talent and superb play, Suh has been known as a player of much controversy, since he has been linked to an aggressive style of play. He was suspended from Detroit’s playoff game once, but later won the appeal and the suspension was annulled. When it comes to his personal life, he has reportedly been dating track and field athlete Lori Lolo Jones since spring 2015. Suh is a multiple benefactor: in April 2010 he donated $2.6 million to the University of Nebraska making it the largest single charitable contribution given by any former university player. He also donated $250 000 to Grant High School in 2013. Bearing in mind he has a construction management degree from Nebraska, Suh has ambitions of becoming a general contractor when he finishes his professional sports career. 1 Won the Associated Press 2010 NFL Defensive Rookie of the Year award. 2 Professional football player with the Detroit Lions, 2010-present. 3 Selected #2 overall in the 2010 NFL draft by the Detroit Lions.